Safaa and Al are Fun In the Sun Weddings’ newest newlyweds! 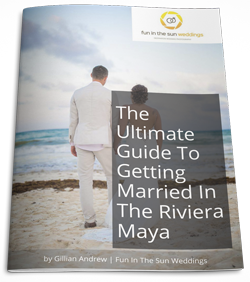 This bride and groom chose one of our favorite off-resort wedding venues for their destination wedding in Playa del Carmen, giving them the freedom to plan the wedding of their dreams. Saf and Al were married the day after Valentine’s Day in a Grand Coral Beach Club wedding. We love this wedding venue because it offers privacy, flexibility and ease for couples getting married on the beach. 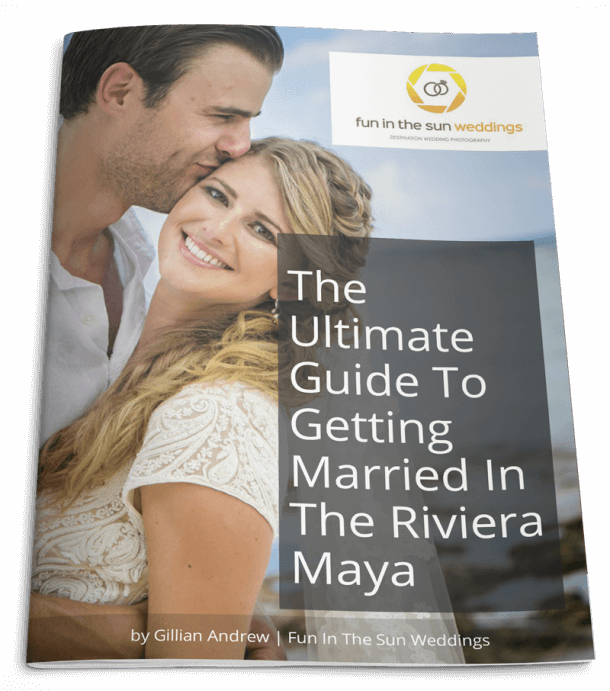 They hired the experts at Weddings Riviera Maya to plan their romantic and joyful celebration. They had a color palette of white and yellow, with pops of turquoise to compliment the sea. Even Al and his best man wore white. 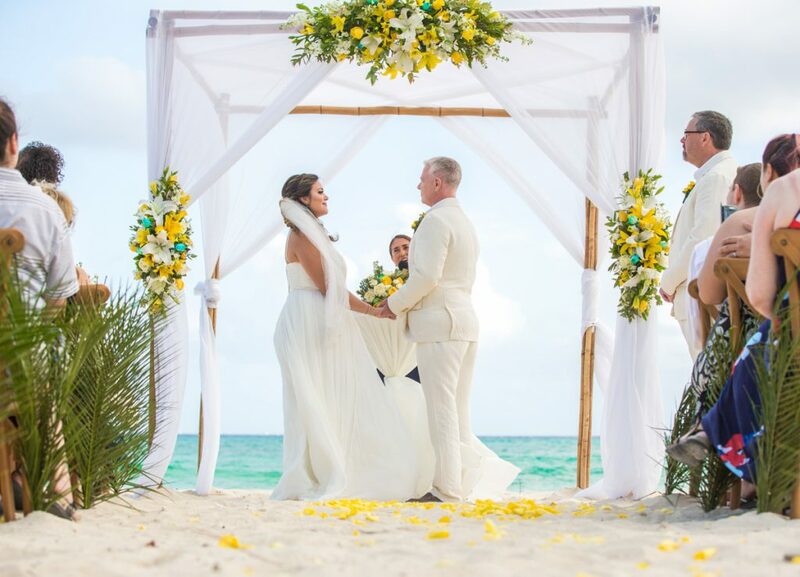 After saying “I Do” on the beach under an arch draped with lush greenery, yellow florals, and a hint of turquoise, they retired mere feet away to the Grand Coral Beach Club’s beautiful beachfront terrace for the reception and party. And did they party! Half the wedding guests ended up in the pool, including Saf & Al themselves! Literally and figuratively ‘Taking the plunge’. Saf and Al, it has been an honor to share in this special moment in your lives. We hope the joy from your wedding day is woven throughout this next chapter of your lives together. Congratulations! Al and I are just in love with our wedding photos. They are truly truly spectacular and I feel complete having them. The work itself is just brilliant and the experience we had with Marc was really like no other. If we ever have another occasion that requires photography in Mexico, we will look no further.